Very reliable product. Have used many times for culturing vegetables and sauerkraut and have never had a failure. Highly recommended product. Great product improved my fermented vegetables 100% they taste much better now! Cheers! I'm really happy with my 370ml and 290ml Weck jars and the shape of the 580ml Weck Tulip Jars are a delight to behold. These sizes are so handy to store small portions of left-overs or for freezing 1-serve portions for later use. I can't wait to buy another batch of a larger size to cover all manner of storage needs. They arrived before Christmas which I wasn't expecting as I only ordered them a couple of days earlier. Thank you. This is great to use when making Sauerkraut, Kimchi or other fermented vegetables with your Mad Millie Fermenting Crock. This provides a faster more reliable fermentation. 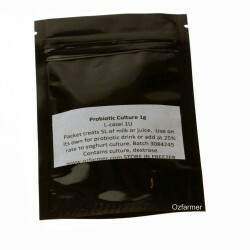 Each packet has 5 sachets, each sachet treats approximately 2 kg of vegetables.